Sunday, Oct. 6, evening twilight. A triple conjunction low in the southwest just after sunset. The moon will meet up with three different planets in the evening sky during two upcoming celestial encounters, one on Sunday (Oct. 6) and the other on Tuesday (Oct. 8). 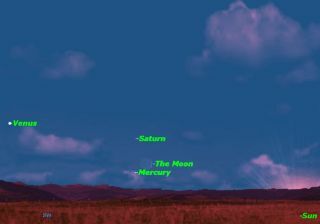 The ringed planet Saturn, sinking into the west-southwest twilight, is close to Mercury in early October. About 40 minutes after sunset on Sunday, try catching a glimpse of Saturn hovering about 5 degrees above a razor-thin sliver of a crescent moon that's just two days past new phase and a mere 4 percent illuminated by the sun. You might have a better chance of seeing this trio if you live in the southern United States, for all three will appear somewhat higher from there as opposed to the view from the northern U.S. or southern Canada. This will probably be your last chance to see Saturn in the evening sky before it transitions into the morning sky early next month. Two nights later will be a different story. On Tuesday evening, the moon will be about three times higher and more than four times wider (18 percent illuminated), making it a much more obvious target to see with both binoculars and your naked eye. And its companion will be the brightest of all planets, Venus. This dazzling evening star, shining with a radiance 48 times brighter than Mercury and 85 times that of Saturn, will be readily visible hovering about 7 degrees below and slightly to the right of the moon. In spite of the rather wide gap separating them, both will make for an eye-catching sight in the southwestern sky. It has shifted from the west to the southwest. Objects at a given altitude above the horizon in the southern part of the sky take longer to set than objects at the same altitude due west. Venus is also finally climbing higher during October, and it now stays above the horizon until twilight is long over. The planet will be at its highest (and best position for viewing) in late November and early December. Behind Venus, Antares and the other stars of Scorpius, a "summer" constellation, slide westward during October on their way out for the year. On the evening of Oct. 16, look for the 1st-magnitude star Antares — the Heart of the Scorpion — shining south (to the lower left) of Venus by just 1.5 degrees; that’s about a finger’s width at arm’s length. Antares twinkles with a distinct reddish hue and is less than 1 percent as bright as Venus. Telescopically, Venus is becoming a more interesting sight as it draws nearer to Earth and becomes less gibbous. Watch it change in phase from two-thirds illuminated now to half-lit around the end of the month. It will be exciting in coming days and weeks to watch Venus grow in prominence in our early evening sky. Now that it is getting darker earlier in the evening, more and more people will be noticing it as they come home from work and school. Many will insist that Venus is a "new" attraction in the sky, even though it’s been an evening object now for the last five months!